Welcome to the Counselor’s Corner. Here, you will find information about counseling events and about resources in the community! My ultimate goal as a school counselor is to design and deliver comprehensive school counseling programs that promote student achievement. The programs target all students, are proactive rather than reactive, and are developed to meet the needs of all the students. 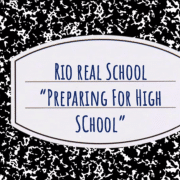 Hi students, families, and staff of Rio Real School! This is my fourth year as a school counselor at Rio Real School, and I feel privileged to serve our students and their families. I am thankful for having the opportunity to work with kind, caring, and respectful students. As a school counselor, using the Restorative Justice approach, I strive to help children develop problem solving skills, a good sense of self-awareness that promotes a healthy self-esteem, and an understanding of respect for others, and appreciation for differences and diversity within our school and community. I support and promote a safe learning environment by incorporating effective Restorative Practices. I also facilitate groups, provide individual counseling, refer students and their families to community resources, and provide families the information/tools to best support their students to achieve academic success, among other things. I can be contacted at anytime through a teacher, office staff, or by calling me at 805-485-3117, ext. 112; you can also e-mail me at mjimenez@rioschools.org.